Try to have everyone ready when the photographer arrives. We prefer to do the opening shots early, so you aren’t rushing before the ceremony. We have also noticed over several years of providing wedding photography that everyone looks great before the ceremony so what better time to take the formal portraits of the wedding party and families. It also allows more time for everyone to enjoy the affair. you don’t want the paid professional competing with them for any important shots. Should the bride and groom see each other before the wedding ceremony? Several years ago it was “traditional” for the bride and groom to be photographed after the ceremony. Most of the split sessions, of the bride and groom seperately, were done before the vows, and the group shots were done after the ceremony. This usually resulted in the guests waiting at the reception for an indefinite period of time. Today, more than 90% of couples choose to have all of the formal group photography taken prior to the ceremony. There is a certain anticipation about not seeing your “betrothed” before the wedding. An idea that Steve introduced to this area is called “private time” or “special moments” photography sessions. 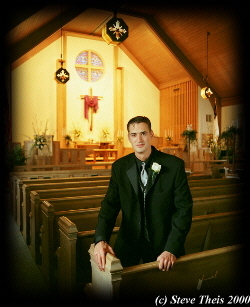 The sanctuary or another location can be chosen to be used for the bride and groom to see each other prior to the ceremony. The groom is to stand with his back turned. When he hears the rustle of his bride’s gown he knows that they are going to have one of the most intimate and precious moments of the entire day. They can kiss, exchange hugs, pray, or share gifts in private. This is probably the only time they will be alone together until the end of the day. It is also an excellent time for Steve and Chris to capture photographs that will be very meaningful later. Scheduling the formal photographs before the ceremony isn’t just a good suggestion, it’s a valuable investment tip to maximize your time and optimize your wedding day experience. It makes a difference not only in the photographs, but in the whole wedding experience. In the twenty-five years that Theis Photography has conducted formal sessions before the ceremony, we have never had a couple regret it. 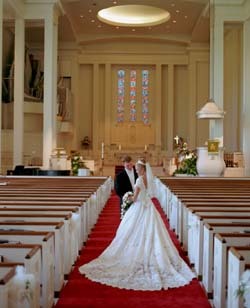 Quite the contrary, most couples have thanked us because it was the most personal and intimate moment of their wedding.